Surrah Rahman:Then which of the blessings of your Lord will you both deny! Ar-Rahman is often regarded as the 'beauty of the Quran', in accordance with a hadith: Abdullah ibn Mas'ud reported that the Prophet Muhammad (may peace and blessings of Allah be upon him) said, "Everything has an adornment, and the adornment of the Qur'an is Surah ar Rahman"
In the Name of Allah, the Most Gracious, the Most Merciful. 1. He has taught the Qur'an. The sun and the moon (run) on fixed courses. And the Najm and the trees prostrating. And the heaven He has raised high, and He has set up the balance. In order that you may not transgress the balance. And observe the weight with equity and do not make the balance deficient. And the earth He has put down (laid) for Al-An'am. Therein are fruits, date palms producing Akmam. And also corn, with (its) `Asf, and Rayhan. Then which of the blessings of your Lord will you both deny? He created man from sounding clay like the clay of pottery. And the Jinn He created from a smokeless flame of fire. 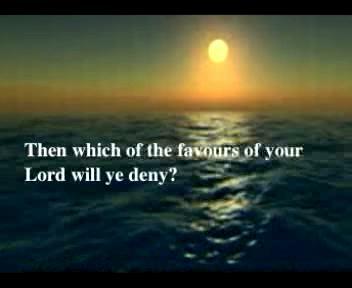 Then which of the blessings of your Lord will you both deny! The Lord of the two easts and the Lord of the two wests. He has Maraja the two seas meeting together. Between them is a barrier which none of them can transgress. Out of them both come out pearls and Al-Marjan. And His are Al-Jawar Al-Munsha'at, in the seas like A`lam. Whatsoever is on it (the earth) will perish. And the Face of your Lord Dhul-Jalal wal-Ikram will remain forever. Whosoever is in the heavens and on the earth begs of Him. Every day He is (engaged) in some affair! We shall attend to you, O Thaqalan! O assembly of Jinn and men! If you are able to pass beyond the zones of the heavens and the earth, then pass beyond (them)! But you will never be able to pass them, except with authority (from Allah)! There will be sent against you both, Shuwaz of fire and Nuhas, and you will not be able to defend yourselves. Then when the heaven is rent asunder, and it becomes Wardah like Dihan. So, on that Day he will not be questioned about his sin, (neither) human nor Jinn. The criminals will be known by their marks, and they will be seized by their foreheads and feet. This is the Hell which the criminals denied. They will go between it and Hamim An! But for him who fears the standing before his Lord, there will be two Gardens. In them (both) will be two springs flowing (free). In them (both) will be every kind of fruit in pairs. and the fruits of the two Gardens will be near at hand. 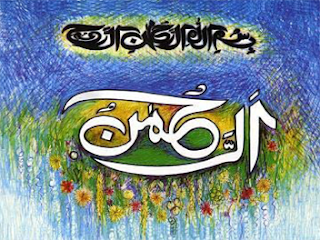 Wherein both will be Qasirat At-Tarf, whom never deflowered a human before nor Jinn. They are like Yaqut and Marjan. Is there any reward for good other than good! And below these two, there are two other Gardens. In them (both) will be two springs Naddakhatan. In them (both) will be fruits, and date palms and pomegranates. Whom never deflowered a human before nor Jinn. Reclining on green Rafraf and rich beautiful `Abqariy. 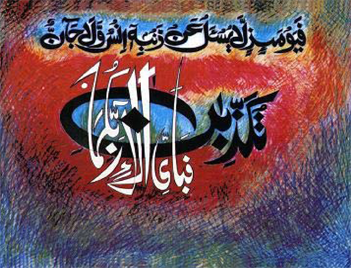 Blessed be the Name of your Lord, Dhil-Jalali wal-Ikram. 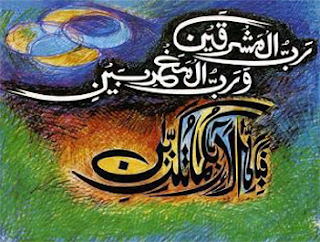 #Allah has established the entire system of the #Universe on justice. Had there been no harmony and balance and justice established among the countless stars and planets moving in space,and the mighty forces working in this #Universe , and the innumerable creatures *and things found here, this life on earth would not have functioned even for a moment. Look at the creatures existing in the air and #water and on land for millions and millions of years on this earth. They continue to exist only because full #justice and balance has been established in the means and factors conducive to life:in case there occurs a slight imbalance of any kind,every tract of lift would become extinct. As you are living in a balanced #Universe , whose entire system has been established on justice, you also should adhere to justice. For if you act unjustly within the sphere in which you have been given authority, and fail to render the rights of others, you would indeed be rebelling against the #nature of the Universe; for the nature of this Universe does not admit of injustice and perversion and violation of the rights. Not to speak of a major injustice, even if a person fraudulently deprives another of an ounce of something, by giving him short measure, he disturbs the balance of the entire Universe.-This is the second important part of the Qur'anic #teaching that has been presented in these three verses. The first teaching is #Tauhid and the second is justice. Thus, in a few brief sentences the people have been told what teaching has been brought by the #Qur 'an which the Merciful #God has sent for the guidance of man. 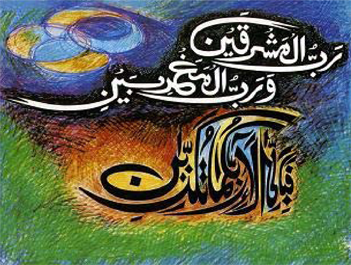 You are As-Salam, and peace comes from You.